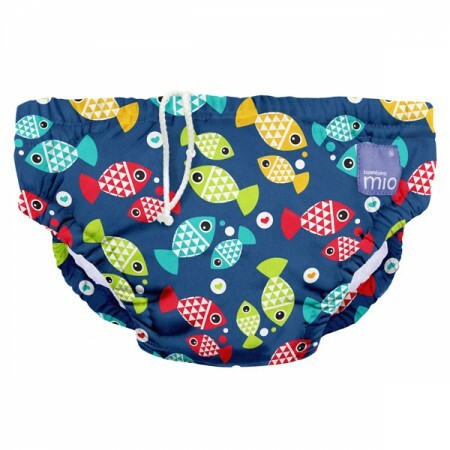 Top Notch Material: Swim Diapers from Bambino Mio are CUTE and effective! Swim Diapers from Bambino Mio are CUTE and effective! Even though I do not have the time now to use cloth diapers like I did with my second son, we definitely still use cloth swim diapers. Why? Well, swim diapers are EXPENSIVE, and not very cute at all. Bambino Mio sent me two very cute little swim diapers for the princess and I just love them! I have the unicorn put up for next summer, and this year she is sporting the mermaids. These diapers look adorable by themselves with only a UV shirt on too. They hold feces very well, and hold urine better than traditional swim diapers! They have a pull on the inside of them so you can pull them as tight as they need to be to work effectively for your little one. One of these super cute swimmies is only $9.99 which is an incredibly affordable price! This diaper will last the entire summer, and possibly into the next year depending on how fast your little one grows, so it truly is a money saver....and SOOOO CUTE! Since it is so cute, you will also save on swimwear, because you WILL WANT to show this diaper off at the pool! The quality of this diaper is great. I have washed it several times, and it is still just a brightly colored as it was before, and has no piling. I am very impressed with Bambino Mio and will be buying more Swim Diapers.